When a pregnancy terminates naturally before 20 weeks, it is termed as miscarriage. Around 15 – 20% of all known pregnancies end in a miscarriage. The figure will be even higher because miscarriage can occur way earlier before the woman is even aware of being pregnant. It is passed off as heavy periods which are on time or slightly off schedule. The chances of miscarriage decrease when heart beat has been detected during Ultrasound. Here we will be looking at 9 weeks pregnant miscarriage risk, how to deal with it and how to prevent it. What Is Happening at 9 Weeks Pregnant? 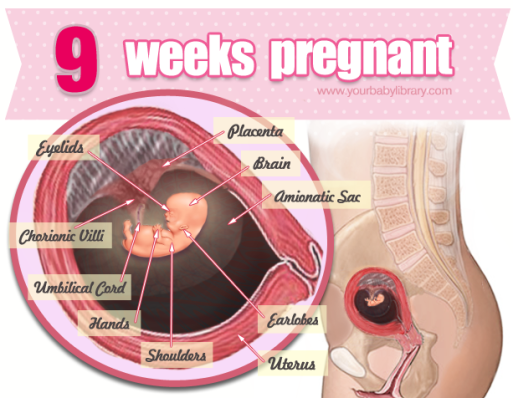 By 9 weeks of pregnancy, the embryo is referred to as fetus. It measures around 1 inch in size and separate digits are seen on hands and feet. Valves are formed in the aorta and pulmonary blood vessels of the heart. The liver is forming the blood cells; elbows, knees, wrists and ankles are being formed as well. Testes or ovaries are also well developed by this stage. It depends on whether fetal heart rate was detected and if there is presence of bleeding. Age of pregnancy is also a crucial factor. If fetal heart beat is not detected and there is vaginal bleeding, the risk of miscarriage is very high. The risk is significantly low when there is no bleeding and heartbeat is also detected. I was aware that once fetal heartbeat is seen, the chances of miscarriage are low, and that the heartbeat is seen around 5-6 weeks of pregnancy. I had not seen the heartbeat for my baby, but I miscarried at 10 weeks. So I am sure my baby had a heartbeat for 4-5 weeks. It is important to try and remain positive and not give up hopes. It is possible to that it is not seen in the first scan and is a false alarm. It is normal to have concerns and sometimes ultrasounds can scare you. It is important to discuss with your doctor and share any fear or concern with them. Ask them to explain the situation well so that you are ready to handle it. After the age of 30, the risk of miscarriage is 12%, after 35 years it is 39% and after 40 years it doubles. When the partner is 35 years of age, the risk increases by 43% and by 50 years, the risk is 90%. For someone who has conceived after one year of trying, the risk of miscarriage is double. The risk of miscarriage increases by smoking, working outside and previous miscarriages. After one miscarriage the risk of another one is 7%, however, the risk doubles after 3 or more miscarriages. Once a fetal heartbeat is seen, the risk of miscarriage is around 2%, but it goes up to 18% in women who have recurrent miscarriages. Bleeding or cramps are the obvious signs of miscarriage. The bleeding could be heavy or light, can come and go and can have blood clots. A pregnancy scan can reveal early miscarriages, where an empty sac is present instead of an embryo. This is referred to as silent or missed miscarriage. Sometimes, the symptoms associated with pregnancy like nausea or breast tenderness disappears, because of drop in pregnancy hormones. Late miscarriage can involve pain similar to labor pain, heavy bleeding and sometimes-even water breaking. If it is caused due to weak cervix, there might not be any pain. Whenever a miscarriage occurs it is an overwhelming and emotional phase to get over. It is important to grieve and recover from the loss. It is equally important to let your partner grieve as well. Look to the future and when ready emotionally, remember that couples have babies after miscarriage. Counselors from local hospitals or someone from Miscarriage Association can be approached for advice and support. Each experience is different and you should give time to get over it. You can try to prevent miscarriage before or after conceiving and lower your 9 weeks pregnant miscarriage risk. Before Pregnant: Get healthy to ensure that healthy atmosphere is provided for conception to occur. You can include regular exercise, eating healthy, not smoking, effective stress management, healthy weight and taking folic acid supplements in your daily routine. After Pregnant: Protect the abdomen, avoid alcohol, avoid active and passive smoke, do not take OTC medicine without consulting doctor, restrict intake of caffeine, try and avoid x-rays, radiation and infectious diseases. Avoid any sports which can cause injury.